The identity and access management market is in transition. It has been dominated by on-prem IAM solutions such as Microsoft Active Directory®. With the changing IT landscape, though, a new generation of technology is emerging. It’s called cloud identity management. Not surprisingly, IT organizations are shifting their approach to identity management to be delivered from the cloud. 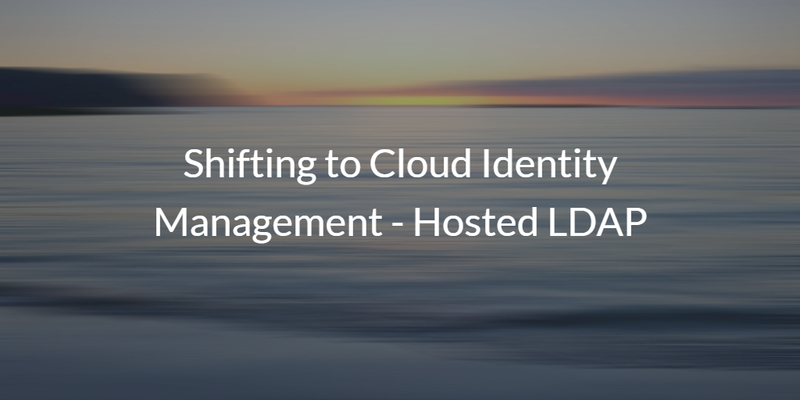 A key component of the cloud identity management space is a capability called hosted LDAP. As most IT admins know, installing, configuring, and managing LDAP is painful. LDAP is supposed to be a “lightweight” directory. However, it has become incredibly powerful and amazingly complex over the years. While there is a wide variety of on-prem, open-source implementations of LDAP, including OpenLDAP, Apple Open Directory, Apache Directory Service, Directory 389, and more, all of these implementations are on-prem software components that an IT organization needs to set up and manage. It’s a tremendous amount of work. With the shift to IT management tools delivered from the cloud, the capability of an on-prem LDAP instance to be hosted in the cloud is now possible and extremely valuable. There are a number of benefits to outsourcing LDAP to a cloud identity management provider. Let’s go over a few, shall we? Zero Maintenance – the benefit of SaaS-based solutions is that you shift the heavy lifting of installation, configuration, and ongoing management to the third-party SaaS provider. You also get the benefit of only paying for what you use versus investing ahead of the curve. Standardization – LDAP has many unique aspects to it, and many IT resources have taken a number of liberties in how to implement LDAP authentication. With a cloud-hosted LDAP implementation, you get standardization of authentication paths and APIs. You will be able to connect a wide variety of applications to a virtual LDAP instance. Security – ensuring that you have a high-security environment can get expensive. A cloud LDAP provider implements a number of security controls and then can amortize the cost of all of that security over its entire customer base. You will also avoid having to spend a number of resources on securing your on-prem LDAP instance. Cloud identity management solutions offer a wide variety of capabilities, including centralized user management, cloud RADIUS, True Single Sign-On™, multi-factor authentication, GPO-like capabilities across platforms, and much more. A key part of their functionality is a cloud-hosted LDAP solution. If you would like to learn more about the cloud identity management solution hosted LDAP, drop us a note. The benefits of leveraging LDAP from the cloud are immense, including zero maintenance, standardization, and security. Also, feel free to sign up for an account to test it out. Finally, please be aware that your first 10 users are free forever.